This onboard view shows the successful spacecraft separation about 45 minutes after launch. The Mars Science Laboratory, or Curiosity rover, is now on its way to Mars. CAPE CANAVERAL, Fla. — With a picture-perfect launch behind it, NASA's new Mars rover has begun the long trek to the Red Planet. The car-size Curiosity rover blasted off today (Nov. 26) at 10:02 a.m. EST (1502 GMT) from Cape Canaveral Air Force Station here, and separated from its Atlas 5 rocket right on schedule, about 45 minutes later. The huge robot — the centerpiece of NASA's $2.5 billion Mars Science Laboratory (MSL) mission — is now zipping through space, chewing up the 354 million miles (570 million kilometers) between Earth and Mars. The journey will ultimately take 8 1/2 months. MSL aims to determine if the Red Planet is, or ever was, capable of supporting microbial life. The mission began taking shape in 2003 and was originally supposed to launch in 2009, but it couldn't meet that deadline. The two-year slip helped boost MSL's overall cost by 56 percent. 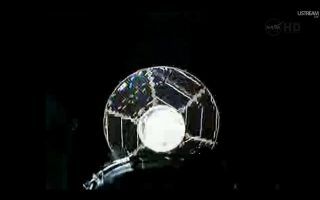 The mission's prior troubles may have made today's successful launch especially sweet for the MSL team. "Today's a great day," Theisinger said. "Very happy guy." However, Theisinger was quick to point out that liftoff is just phase one of a complicated mission that is slated to last a minimum of about two Earth years. "We all recognize that this is the prologue to the mission — necessary, but not sufficient," he said. "We all have our work cut out for us in the next 8 1/2 months." Curiosity is slated to touch down on Mars in August 2012. But mission team members won't exactly be putting their feet up during the 1-ton rover's long cruise. For example, Curiosity's spacecraft will make a series of trajectory corrections, with the first coming in about two weeks. The team will also perform an engineering test in the next few weeks, with a check of the rover's 10 science instruments coming shortly thereafter, Theisinger said. This artist's concept depicts the Curiosity rover as it is being lowered by a rocket-powered descent stage during a critical moment of the "Sky Crane" landing in 2012. Mission scientists will spend the cruise phase preparing for Curiosity's work on the Martian surface. They'll stage 10 separate operational readiness tests over the next 8 1/2 months, gauging their ability to recognize and respond to potential issues that may crop up, researchers said. "You're basically just kicking the tires and trying to shake it all out," Caltech's John Grotzinger, MSL's project scientist, told SPACE.com. Curiosity will land at the 100-mile-wide (160-km-wide) Gale Crater. A mound of sediment rises 3 miles (5 km) into the Martian air from Gale's center. The rover will investigate this mountain's many layers, scrutinizing the red dirt and rocks for any signs that Martian environments may once have been habitable. The rover's landing will likely inspire more nervous hand-wringing than its launch did. A rocket-powered sky crane will lower Curiosity down to the Martian surface on cables, a daring maneuver that has never been tried before. The MSL team spent a lot of time designing and validating this unprecedented landing system, and they'll keep working over the next 8 1/2 months to give it the best chance of succeeding. But today offered the scientists and engineers who brought Curiosity from the drawing room to the launchpad a chance to reflect and exult — at least for a little while. "Science fiction is now science fact," said Doug McCuistion, head of NASA's Mars exploration program. "We're flying to Mars."